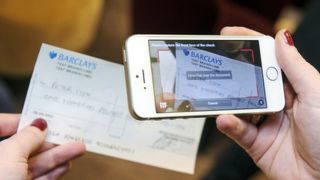 The government has announced plans to trial a new scheme that would allow smartphone users to pay a cheque into their bank account simply by taking a photo and sending it electronically. The scheme, which has the backing of the UK's major banks, would also allow cheques would clear in just two days, rather than the current five or six it takes for funds to become available. Now the government plans to launch a consultation on the matter and will look into making the requisite legal amendments such a change would require. Barclays will be among those banks to begin piloting the scheme in April 2014, with hopes the feature will be available to all of its customers by the end of the year. "Moving into a virtual world will actually create a more secure customer experience than the paper experience today," said Antony Jenkins, the chief executive of Barclays. Electronic cheque deposits are already widely used in the United States, with most of the major banks folding the functionality into their mobile apps. The legal change was made stateside following the 9/11 terrorist attacks on the World Trade Centre, in order to cut down the paper trail across the country. How is ARM going to shake up banking and shopping online?